Had to change bottles before I could make coffee. And breakfast. I think next year I may invest in a second bypass regulator, though this is a very minor hassle compared to having only one bottle on the bedroom’s regulator. A cookstove bottle lasts six weeks or more unless I’m doing something sinful, like heating the cabin with the stove. Which I confess has happened but not in the past couple of years. Glad I built that shelf over the regulator, which is right under the cabin’s main drip edge. Cold doesn’t affect it but ice can, and there was quite a lot of dripping yesterday before the final show which was late enough for the air and ground to have cooled enough not to melt the snow. 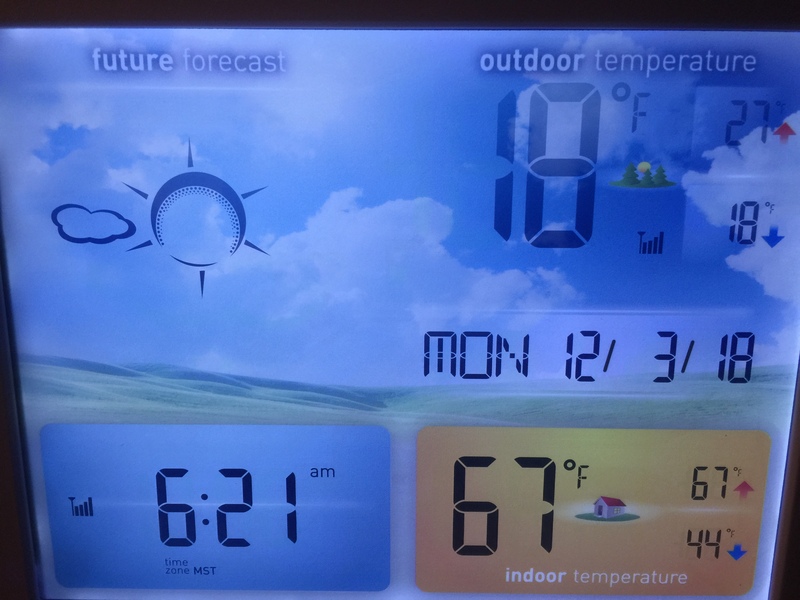 First light I have to clean off the solar panels, but it won’t matter: Today is supposed to be cold and clear. 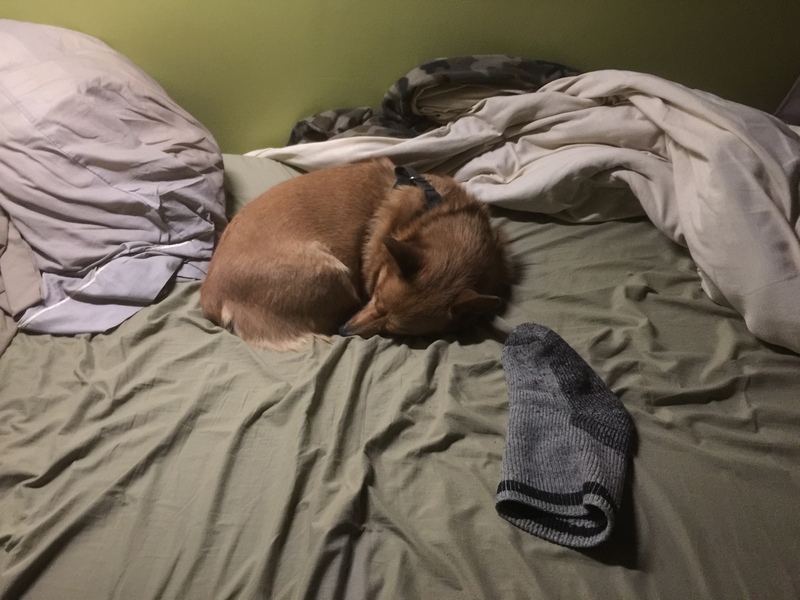 While I was sweeping snow off steps and swapping frigid propane bottles he was quite content to keep the already-warm bed warm – you know, just in case. He’s very unselfish that way. Seriously, I’m not making this up. A Wyoming dog that gives every indication of hating snow and cold. Hey if your Willie dragged through the snow every time you went outside you’d hate winter too. As for the propane seeming to run out on the coldest days it does. The stuff contracts with temperature, If you can keep the bottle warm you’d get more juice out of it when it is at its low point. 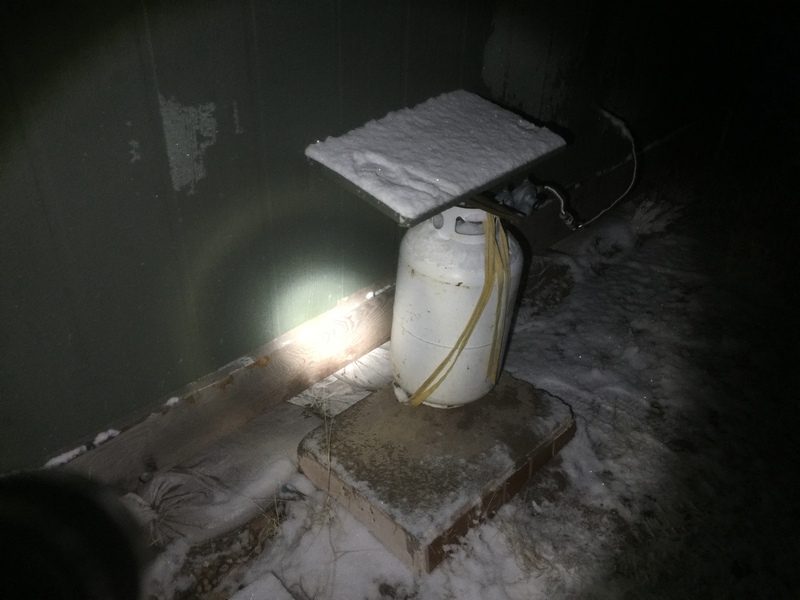 Up here in Maine you need at least one of those chubby 200 lb bottles to have sufficient surface area to provide enough evaporative surface on the LPG to keep the kitchen stove going in winter. One of those 500cc standby Generac generators requires two of those bottles to provide enough surface area to keep the motor running. Seems like a really, really good idea to me. Some technology is actually beneficial. The Ideal Gas Law PV=nRT gives the answer. V volume is fixed, so when T temperature goes down then P pressure gets too low to light off. The bypass regulator would make your life better. You might box a garbage bagged bottle in, then pack between box and bag with chicken manure/straw and/or organic compost so decomposition would provide some heat to get a little more propane out. Still going to quit on you on a cold morning and yuck!/vermin factor + work. You are a sophisticated hermit, go bypass regulator NOW for a better winter. The three laws of thermodynamics- 1) You cannot win. 2) You cannot break even. 3) You cannot get out of the game. Does the Lair really need two separate gas systems? Can;t you plumb your stove to the furnace gas supply? Yeah, I never understood the practice of marking the solstice as the beginning of winter. Everywhere I ever lived where winter was even a thing, if you hadn’t frozen to death by the solstice you weren’t trying very hard. I could do that if I really wanted to, but this is more convenient and I like redundant systems that don’t bring everything crashing down when they fail. Call it a lack of faith in my own engineering skills. Plus it would be a lot of work. Man, if you’re not bitchin’ about TB being underfoot, you’re bitchin’ about him NOT being underfoot! Joel, dogs are in many ways just like humans; as they age they like cold less and less so no surprise whatsoever on the reaction. I have to push my 14 year old Westie out the door to do her thing when there is snow on the ground, even pouring rain gets me a nasty look, if I don’t I might end up with puddles or little brown piles on the basement floor (at least she does go down there and not the main floor). So cut TB some slack and maybe build a little ramp along side the steps. Day will come when that is needed. I think the solstice used to indicate the *middle* of winter (or summer, in the case of the summer solstice). Not sure if my memory is wrong (always possible) or not, but if not, then I don’t know why “they” changed it. But then I don’t know why years start in the middle of winter either. First day of Spring would make more sense IMO.